The next time someone asks you where you went on your golf trip, don't bore them with 'The Algarve' or 'Costa del Sol' ! ...Tell them you went to the Lisbon coast in Portugal. 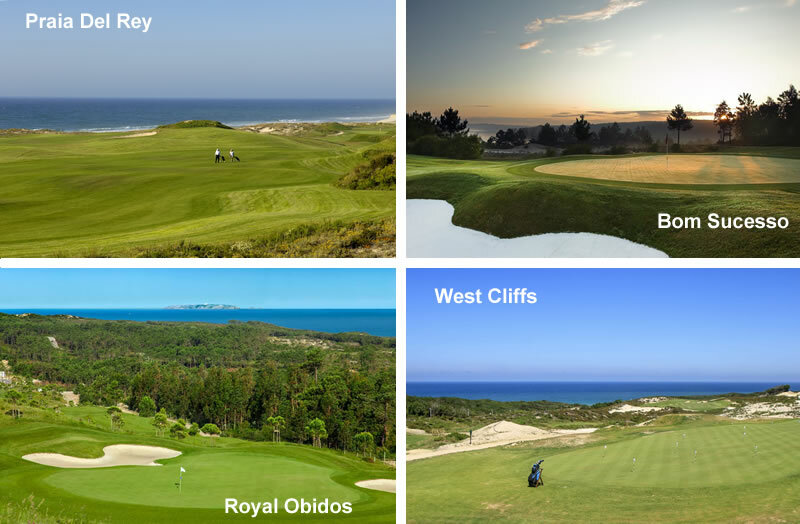 These four courses form the Silver Coast cluster and are only a 15 minute drive from each other. Praia Del Rey and West Cliffs are links courses but in fact all four command spectacular sea views. Autumn, Winter and Spring are the best times of year. Autumn & Spring are sunny and warm. The courses never appear particularly busy at any time of year. I've done golf holidays before and I know how important it is to have good options for eating out in the evenings. As well as the clubhouse restaurants and bar, you can enjoy the convenience of the resort restaurants at Praia Del Rey. Or for something a little more authentic and independent, there are excellent and inexpensive restaurants in the villages near Praia Del Rey. Flights to Lisbon are plentiful from the UK, Ireland and northern Europe. Car hire is easy from Lisbon airport. Try Sixt or Holiday Autos.